Ayahuasca is an Amazonian plant medicine that has been used for centuries, possibly thousands of years, by indigenous and more recently mestizo ayahuasca shaman across the upper Amazon throughout Peru, Colombia, Ecuador and Brazil. There are over 40 other names known for this sacred medicine, including caapi, natema, mihi and yage. The origins of the shamanic use of ayahuasca are lost in the mists of history but there are many different stories among indigenous tribes of the Amazon about the how they initially came to work with this medicine. In an indigenous context, ayahuasca was used by the shamans of the Amazon region for healing and divinatory purposes. Complex rituals surround the preparation and use of ayahuasca that have been passed down through generations of healers. By holding healing ceremonies, they use the medicine as a diagnostic tool to discover the roots of illnesses in their patients. With no written records from the Amazon until the Spanish conquistadors invaded in the 16th Century, the history of ayahuasca is relatively unknown. However, a ceremonial cup containing traces of ayahuasca was found in Ecuador and is believed to be well over 2500 years old. The use of ayahuasca is widespread and represents the basis of traditional medicine practice for at least 75 different indigenous tribes across the Lower and Upper Amazon. practiced all over the world for at least 70,000 years. Shamanism is not a religion, but a method for making transpersonal connection with the sacred realms. It’s at the epicenter of a new cycle of spirituality – one where there is no need for a priest, prophet or guru standing between you and your experience of the sacred realms. Each person becomes their own priest, their own guru receiving revelations from within themselves and higher transpersonal sources. Shamanic healing techniques have been practiced within ancient wisdom traditions across the planet for many thousands of years and we are now experiencing a renaissance in this ‘spirit assisted healthcare’ reemerging in the modern world. Shamans view illness as disharmony in a person’s life on energetic and spiritual levels. This disharmony can lead to mental, emotional, and/or physical illness if left unresolved. A shaman addresses the energetic and spiritual aspect of illness by making journeys into the astral or spirit world; a ‘non-ordinary’ reality parallel to our own physical reality. There the shaman meets transpersonal forces and benevolent plant, animal and human spirits, who are just ‘off stage’ from the human drama, yet willing and able to constellate within and through us. It is these compassionate spirits who perform the healing work with the shaman only acting as a conduit. The Shipibo culture, originating along the Ucayali River in the Peruvian Upper Amazon, is well known for shamanism and plant medicine. 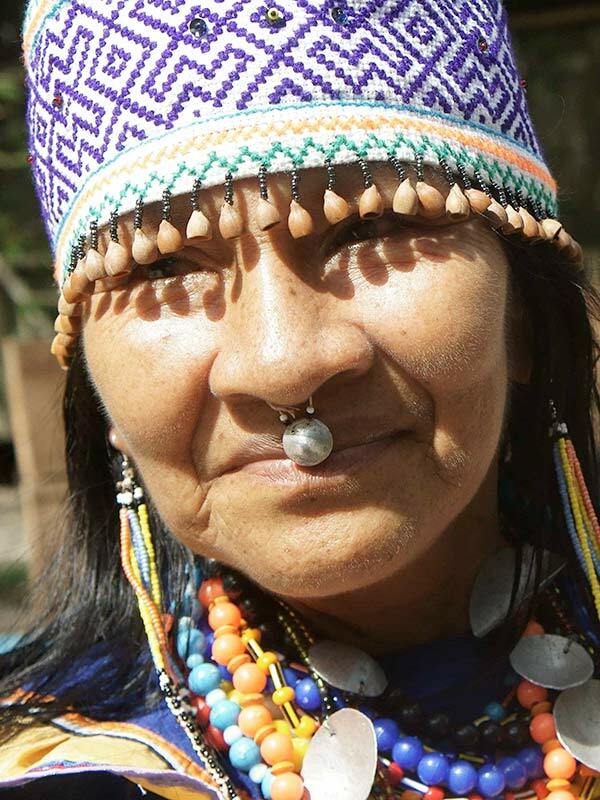 Among the indigenous cultures of the Upper Peruvian Amazon, the Shipibo are one of the few cultural groups that have managed to maintain their language, art and mystical plant medicine. The Shipibo tribe seems to have a particularly strong relationship with ayahuasca and many consider the Shipibo to be the most highly skilled ayahuasca healers in the Peruvian Amazon. The use of Shipibo imagery related to ayahuasca is widespread and the Shipibo patterns of ikaro are synonymous with ayahuasca and its practice throughout Peru. Indeed, many mestizo curanderos (healers of mixed Spanish and Peruvian blood ancestry who have moved away from indigenous traditions and identity) still wear Shipibo cushmas (robes) in ceremony. Unlike all other sacred plant medicines, ayahuasca is made from two plants – the ayahuasca vine (Banisteriopsis caapi) and the leaf of the chacruna plant (Psychotria viridis). Both plants are collected from the jungle to create a potent mixture that offers access to the realm of spirits and an energetic world that that we are typically unable to perceive in our ordinary state of consciousness. 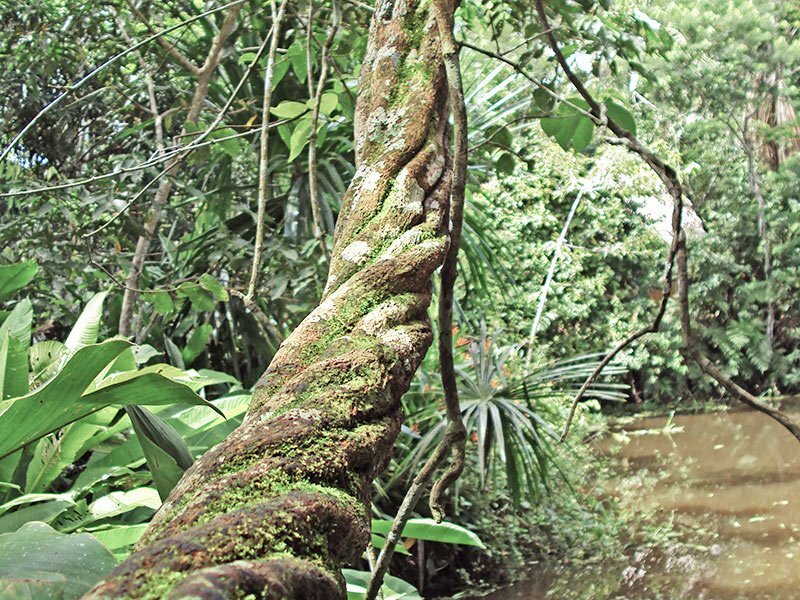 It is a mystery how the Amazonian shamans learned to combine these two ayahuasca vine plants. Individually, both plants are more or less inert. In the Amazon Rainforest there are approximately 80,000 catalogued leafy plant species, of which as many as 10,000 are vines. Neither the vine nor the leaf is especially distinguished in appearance. Yet the healers of the Amazon, acting as archaic psycho-pharmacologists, somehow knew how to use one particular species of vine and one particular species of leaf to make a psychoactive brew. In chemical terms, the leafy chacruna plant contains the powerful psychoactive dimethyletryptamine (DMT), which, by itself, is not orally active because it is metabolized by the stomach enzyme monoamine oxidase (MAO). However, certain chemicals within the ayahuasca vine contain MAO inhibitors in the form of harmine compounds that result in a psychoactive compound with an identical chemical makeup to the organic tryptamines in our brains. This mixture circulates through the bloodstream into the brain, where it triggers powerful visionary experiences and enables us to access otherworldly realms and our hidden, inner subconscious landscapes. to the healers, who use it as diagnostic tool for a variety of tasks that reflect vastly different psychological and cultural values than we are familiar with in the West. Ayahuasca was not taken by patients, who would simply come to ceremony to receive the diagnosis and subsequent treatments. By identifying the cause of illness, bad luck and witchcraft, for example, and resolving the energetic damage caused by jealousy and envy, indigenous healers recognize the destructive power of negative human emotions and their impact not just on the individual but the health of the whole community. 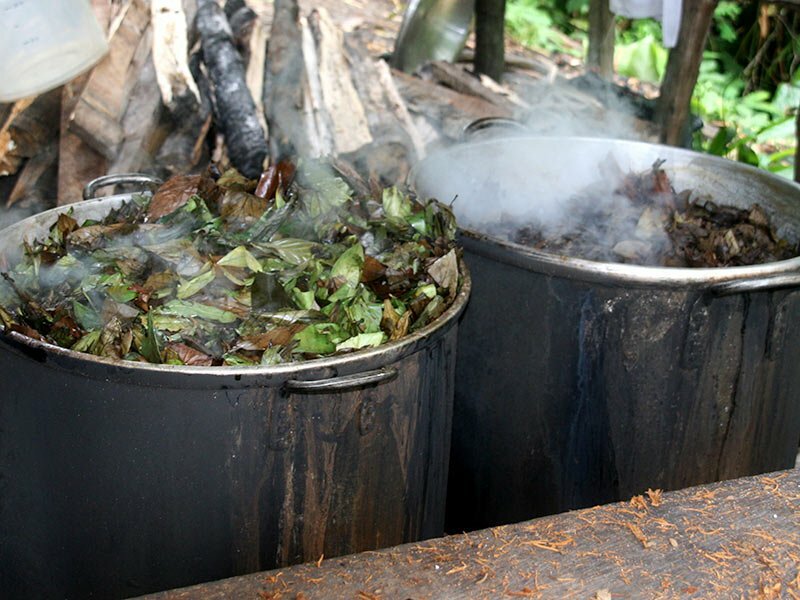 Ayahuasca is used by the healers for other purposes, too: to help inform important decisions; ask the spirits for advice; solve personal conflicts (between families and communities); exercise one’s divine capacities; elucidate mysteries, thefts and disappearances; discover if we have enemies; and to see if a spouse is being disloyal. Ayahuasca is also used to prescribe treatments to patients – through directing the healer to administer ikaros and plant remedies. But it is not the only plant spirit involved. Ayahuasca works with the healer in combination with a plethora of other plant-spirit doctors to provide treatment. Ayahuasca is a nexus within a much larger system of ‘spirit-assisted’ healthcare in the Amazon. Traditional Amazonian healing offers solutions to illnesses and disorders that typically cannot be treated by conventional medicine. There is a global epidemic of people suffering from psycho-emotional illnesses that modern healthcare systems are not able to address. Ayahuasca is reaching out across the globe to offer its significant benefits. Ayahuasca is now being used as a medicine in itself, not just as a diagnostic tool and plant ally for healers. This represents a positive evolution. For the last 20 years, many foreigners and Amazonian people have worked with the medicine in ceremonies, led by trained healers, in order to face the causes of their conditions, illnesses and imbalances personally and to take part in the healing equation. Effectively, this means moving healing into a co-creative relationship between the healer, the plant spirits, ayahuasca, the participant and their own inner physician. The drinker is able to uncover and take personal responsibility for issues that had been hidden in their unconscious and resulted in energetic blockages – often the cause of the dis-ease, or emotional/psycho-spiritual imbalance. However, drinking ayahuasca on your own without the presence, protection and skilled work of an experienced healer is not advised. It will not provide the level of safety, depth of healing and overall efficacy that can be achieved when ayahuasca healing is practiced by skilled healers working with a multitude of plant-spirit doctors in ceremony. In some circumstances, ayahuasca on its own will effect healing (although serious caution is required in terms of the set, setting, intentions and precautionary measures), however it will not enable the drinker to reach and heal the roots of issues. One of the greatest challenges of the movement of ayahuasca culture to the West is how to transfer a tradition rooted in shamanic communities to a culture by and large alienated from nature with integrity, respect and safety. We feel it is critically important to understand and honor traditional practices that indigenous healers have developed over thousands of years of working with ayahuasca.